Two stories are already written about my Revolution Tours cycle ride along the far shore of Lake Wakatipu, all the way to the top. The icy wind, straight off the fresh snow on the peaks, scarcely registers any more, and the toil of working up the hills is forgotten - now it's all about the glorious scenery sparkling in the sunshine, the eternal thrill of whizzing down the slopes, stones pinging out from under my wheels, splashing through fords, and all the yummy food we ate. There was no losing weight on this trip, despite all that healthy exercise: all it did was generate an equally healthy appetite that was more than sated by so much irresistibly delicious food. But what really spun my wheels (sorry) was being outside all day in such beautiful surroundings, changing from lake to farmland to bush to river flats, all surrounded by mountains, experiencing the changes in the weather, and feeling connected with it all in a way that you never can in a car, sealed inside your metal box. You can't appreciate the freshness of the air, the good farm smells and the damp bush, or hear the bellbirds, magpies and yellowheads, the water splashing over the rocks, the waves on the lake breaking on the shore. 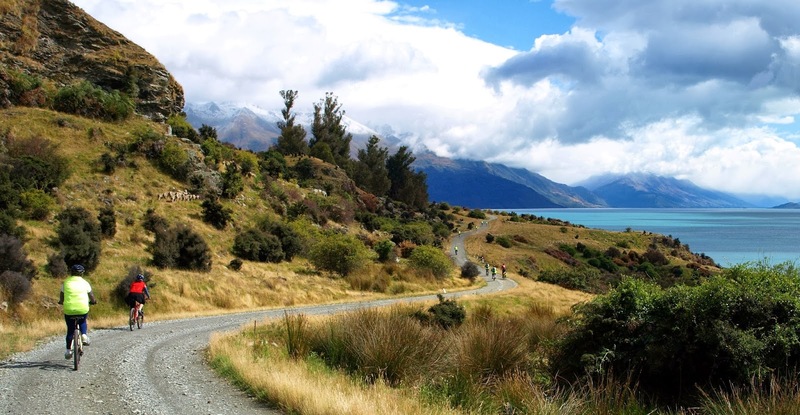 Walking is just as good for that, of course, and the Routeburn day walk made a refreshing change from the cycling. On the tour, not everybody did the tramp, a couple of people staying at Paradise Lodge for what they thought would be a quiet day, not anticipating the activity of a Subaru ad photo-shoot. That end of the lake has appeared on film so many times - not just in Peter Jackson's Tolkien epics, but many others as well, even X-Men Wolverine (although, onscreen, it was labelled 'Canadian Rockies' pft) - and there's no marvelling at that at all. It's mind-blowingly photogenic, and on a still, golden evening just too pretty for words. So here's a photo instead.